This tutorial is based on Ubuntu 12.04. You should already have set up a basic Ubuntu 12.04 system. First we create a non-privileged user called vsftpd (with the homedir /home/vsftpd) belonging to the group nogroup. We will run vsftpd under this user, and the FTP directories of our virtual users will be in the /home/vsftpd directory (e.g. /home/vsftpd/user1, /home/vsftpd/user2, etc.). The configuration options are explained on http://vsftpd.beasts.org/vsftpd_conf.html. The important options for our virtual setup are chroot_local_user, guest_enable, guest_username, user_sub_token, local_root, and virtual_use_local_privs. Please make sure that you replace the MySQL password with your own one! Now open your FTP client program on your work station (something like FileZilla or FireFTP) and try to connect. As hostname you use server1.example.com (or the IP address of the system), the username is testuser, and the password is secret. 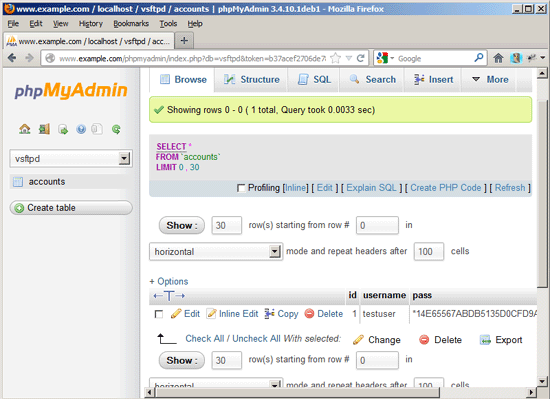 For most people it is easier if they have a graphical front-end to MySQL; therefore you can also use phpMyAdmin (in this example under http://server1.example.com/phpmyadmin/) to administrate the vsftpd database. 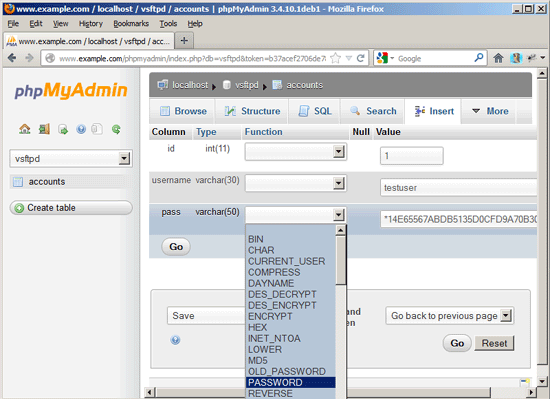 Whenever you create or modify a user, make sure that you use MySQL's PASSWORD function to encrypt that user's password. Also, when you create a new virtual user, please don't forget to create that user's homedir on the shell, as shown at the end of the previous chapter. thank you very much!! the best guide on the web!!! Thank you very much! It was very useful for me.